After not being able to get Adobe Bridge to be able to view SVG’s I went in search for an alternative. For Windows, it would look to be (I didn’t spend a long time searching) the number one solution is an extension that allows your Windows Explorer thumbnail view to show your SVG’s just fine. I’m on Win7 64-bit. 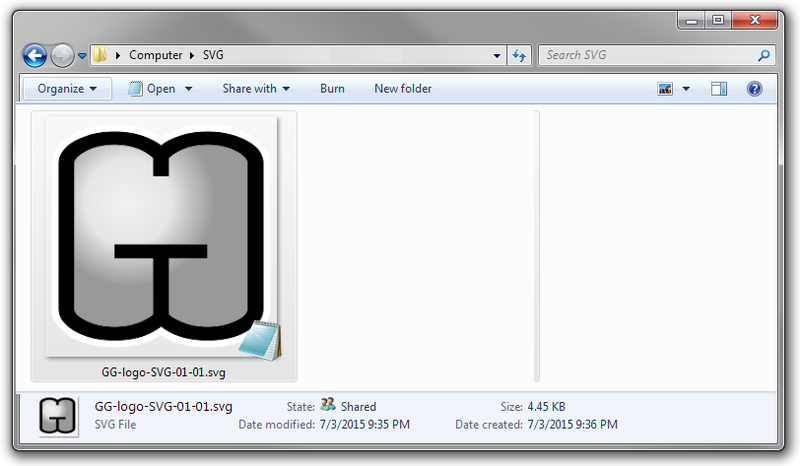 SVG Viewer Extension for Windows Explorer v0.1.1. Get it here. Nothing complex at all. Just visit the site and go to the DOWNLOADS tab. Pick either the 32 bit or 64 bit version. Run the installer file that gets downloaded. Done. No restart or nothing. Just go to a folder where SVGs live and view in thumbnail mode. Edit: Do I wish my Bridge CS6 would view SVGs? Heck ya. But does it? Heck no. I have read a lot about other people being able to view them in Bridge since CS3, but maybe their on Macs, or maybe they include the XMP data when exporting SVGs. I optimize mine and therefore don’t include that stuff when exporting. This is great news Deepak. I look forward to the upgrade! I really do like Bridge and this will be super helpful to my workflow so I’m not always right-clicking to “Reveal in Explorer” so I can see my SVG assets.